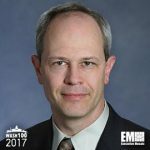 Executive Mosaic is glad to announce ManTech International President and Chief Operating Officer Kevin Phillips as the newest member of the 2017 Wash100 — Executive Mosaic’s annual selection of the government contracting arena’s most influential voices. The 15-year company veteran elevated to the COO post in November 2015 after nearly 11 years as CFO for the Fairfax, Va.-based government services contractor, which saw its revenue climb almost 58 percent to $1.55 billion through organic growth and dozens of acquisitions during his tenure as finance chief. Phillips will hold responsibility for general management and control of operations at ManTech as Founder, Chairman and CEO George Pedersen retains oversight for the company’s overall strategy and vision that includes acquisitions. Approximately one month after his COO appointment, ManTech extended its profile as an active buyer in the GovCon market through the purchase of health information technology services contractor Edaptive Systems. ManTech has prioritized capital deployment for acquisitions in 2017 as the company reported $71 million in cash on hand, no debt and access to a $500 million revolving credit facility in its last quarterly filing in November 2016. Phillips told investors in a Nov. 2 conference call the company viewed more potential acquisition opportunities as set to available in the market after the completion of the election cycle and subsequent budget process. “George has always been and will continue to be focused on acquisition strategy and the growth potential because that’s our primary driver for capital deployment,” Phillips said. Phillips additionally highlighted cybersecurity, enterprise information technology, agile software development, cloud computing, mobile and big data analytics as key areas of investment for ManTech in the company’s defense, civilian, intelligence and federal health markets.